(Nanowerk Spotlight) Photodynamic therapy (PDT) is a cancer treatment that combines a chemical compound – called a photosensitizer – with a particular type of light to kill cancer cells. The photosensitizing agent is injected into the bloodstream. The agent is absorbed by cells all over the body, but stays in cancer cells longer than it does in normal cells. One to three days after injection, when most of the agent has left normal cells but remains in cancer cells, the tumor is exposed to light. The photosensitizer in the tumor absorbs the light and produces an active form of oxygen (singlet oxygen) that destroys nearby cancer cells. PDT has been used for the past 30 years and is a treatment that works. The limitation of this form of cancer treatment is that the light needed to activate most photosensitizers cannot pass through more than one centimeter of tissue: Most of the organic photosensitizers used in conventional PDT treatment are restricted to be activated only by ultraviolet or visible light which do not have deep tissue penetration. Therefore, conventional PDT is limited to work only for surface tumors, but not for deep-tissue buried tumors. To treat tumors located deep inside tissue, it requires stable and strong near-infrared (NIR) light absorbing photosensitizers. However, NIR light activatable photosensitizers are very rare. Moreover, conventional organic photosensitizers suffer from severe photobleaching and enzymatic degradation problems. To overcome these obstacles, scientists developed combinations of nanomaterial-mediated photothermal therapy (PTT) and organic photosensitizer-mediated PDT to achieve synergistic therapeutic effects. However, most of these approaches achieved only tumor suppression rather than complete destruction, especially under low laser dose conditions. To be suitable for clinical PDT treatments, a nanomaterial ought to fulfill the concerns of a) NIR light activation for deep tissue penetration; b) resistance to photobleaching; c) enzymatic degradation; and d) high extinction coefficients for effective light absorption. Numerous previous research results have shown that gold nanorods (Au NRs) are able to effectively kill tumors upon irradiation with high laser doses, leading to hyperthermia-induced destruction of cancer cells. Upon low laser powers, nanomaterial-mediated photothermal therapy (NmPTT) only led to tumor suppression. The conventional wisdom has therefore been that NmPTT can destruct deep-tissue tumors only under high laser power irradiation, which may lead to other adverse effects such as destruction of healthy tissue. 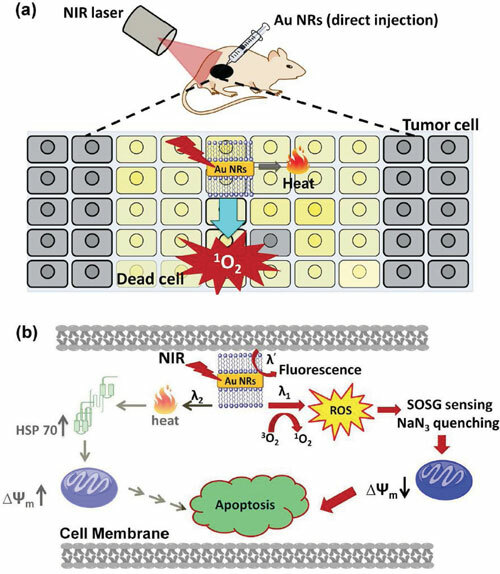 "So far, it has never been reported that Au NRs can be used as NIR light activatable photo-sensitizers for in vivo destruction of solid tumors via photodynamic therapy effects," Kuo Chu Hwang, a professor in the Department of Chemistry at National Tsing Hua University in Taiwan, tells Nanowerk. "Now, though, after several thousands of papers being published in the field of nanomaterials-mediated photothermal therapy induced cellular deaths in the past 10 years, we demonstrate for the first time that bare gold nanorods alone can exert unprecedented photodynamic therapeutic effects to result in cancer cellular deaths at low laser doses." This means that the team demonstrated that, upon NIR light irradiation, internalized Au NRs can exert efficient PDT effects, which is in contrast with the previously literature reported PTT effects, on destruction of tumors in mice. Moreover, it appears that Au NRs-mediated PDT effects are far more effective in destruction of tumors in mice than the Au NRs-mediated PTT effects. Reporting their findings in Small ("First Demonstration of Gold Nanorods-Mediated Photodynamic Therapeutic Destruction of Tumors via Near Infra-Red Light Activation"), Hwang and his team have demonstrated that, upon NIR light irradiation, Au NRs can mediate PDT effects to completely destruct B16F0 melanoma tumors in mice in the absence of additional organic photosensitizers. "We show that gold nanorods can serve as a very superior multi-functional theranostic reagent" says Hwang. "Gold nanorods alone can sensitize formation of singlet oxygen and exert dramatic PDT effects on complete destruction of tumors in mice under very low LED/laser doses of single photon NIR (915 nm, <130 mW/cm2) light excitation, which are very feasible to use for deep tissue clinical PDT treatments." "Gold nanorods are resistant to photobleaching, enzymatic degradation, and also possess a 4-6 orders higher extinction coefficient for effective light absorption than common organic photosensitizers," he continues. "Therefore, they are far more effective than organic photosensitizers. In addition, we also found that gold nanorods can emit single photon-induced fluorescence to illustrate their in vivo locations/distribution." As Hwang points out, the Au NRs-mediated PDT and PTT effects can be switched from one to the other simply by choosing different photoexcitation wavelengths. "This allows us to investigate the relative contribution and efficacies of PDT and PTT effects on destruction of tumors in animal models. We used this to demonstrate, for the first time, that intrinsic Au NRs – without any fluorescent dyes – can be used as in vitro and in vivo fluorescent markers in the visible to NIR region of wavelengths." (a)	Investigation of the long-term cytotoxic effects and immunological responses of gold nanorods in organisms. The immunostimulatory properties of gold nanorods, including antigenicity, adjuvant properties, inflammatory responses, and the mechanisms through which Au NRs are recognized by the immune system, need to be studied. (b)	Design of new multi-functional theranostic reagents which are capable of absorbing incoming light very efficiently for diagnosis and also for production of singlet oxygen upon NIR light activation to facilitate efficient PDT effects for complete destruction of solid tumors. (c)	Development of nanomaterials with extremely high molar extinction coefficients and capability of absorbing light at longer NIR wavelengths, so that deeper tissue penetration depths can facilitate effective therapeutic treatment at ultra-low laser powers, low dosage of nanomaterials, and short irradiation light time.